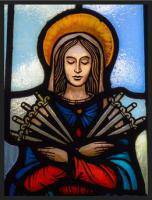 Description: Bishop Cunningham has designated the Memorial of Our Lady of Sorrows - Saturday, September 15 - as a day of prayer and fasting throughout the Diocese of Syracuse for the hope and healing of victims and the forgiveness of our own sins. He will be at OLS to celebrate a Mass of Reconciliation & Hope at 11:00 am. Description: Please join us in the cafe after all Masses for refreshments and fellowship! Description: All are welcome - we will be signing up to sell pumpkins - anyone interested in helping - please attend! Description: Registration begins at 1:00 pm at Binghamton University. Meet at the East Gym parking lot! Description: Room 11 - everything you ever wanted to ask about an annulment! Description: Traditions at the Glen - deadline to purchase tickets is 4:00 pm on 9/17. Description: Please help us unload the truck!!! Pumpkin sales continue throughout October. All proceeds benefit our Youth Activities. Bishop Cunningham has designated the Memorial of Our Lady of Sorrows - Saturday, September 15 - as a day of prayer and fasting throughout the Diocese of Syracuse for the hope and healing of victims and the forgiveness of our own sins. He will be at OLS to celebrate a Mass of Reconciliation & Hope at 11:00 am. Please join us in the cafe after all Masses for refreshments and fellowship! All are welcome - we will be signing up to sell pumpkins - anyone interested in helping - please attend! Registration begins at 1:00 pm at Binghamton University. Meet at the East Gym parking lot! Room 11 - everything you ever wanted to ask about an annulment! Traditions at the Glen - deadline to purchase tickets is 4:00 pm on 9/17. Please help us unload the truck!!! Pumpkin sales continue throughout October. All proceeds benefit our Youth Activities.